BJP President Amit Shah on Monday said that Prime Minister Narendra Modi has put an end to the politics of "dynasty, caste and appeasement" and attacked the Congress over its frequent slamming of the government over jobs and GST.Initiating the debate in the Rajya Sabha on the motion of thanks on the President's address, Shah pitched for simultaneous elections to the Lok Sabha and the assemblies and accused the Congress of "opposing" the triple talaq bill and the legislation to give constitutional status to the National Commission for Backward Classes. In his maiden speech in parliament, he took on Congress President Rahul Gandhi over his description of the Goods and Services Tax as "Gabbar Singh Tax", claiming that problems of employment had been created during 55 years of Congress rule. He also slammed Congress leaders for their criticism of Modi over his remarks in an interview that people earning Rs 200 a day selling 'pakodas' (fritters) can be considered employed, saying: "Selling pakodas is not shameful but comparing it with begging was. "Citing the BJP's repeated victories in assembly polls after the last Lok Sabha polls, he said that "people's mandate" was the best way to judge the performance of a government irrespective of what its opponents say. He made special mention of the BJP victory last year in Gujarat -- his and Modi's home state -- and said the party had won another mandate there after ruling for over two decades and had got almost every second vote polled. "We can't help it if some people see victory even in their defeat," Shah said taking a jibe at Rahul Gandhi and the Congress, which had seen its best results in the state polls in over two decades. Saying there were "three cancers" - dynasty politics, casteism and appeasement - which were destroying the country, he asserted that "we can proudly say today that Prime Minister Narendra Modi has uprooted all of them from the Indian political system". The Prime Minister was present in the house during Amit Shah's speech.Repeatedly cheered by the treasury benches during his about 80-minute speech, Shah said that Modi had brought the triple talaq bill to give rights, equality and social security to women but the Congress was "opposing it". As Congress members sought to speak, he said the bill, passed by the Lok Sabha, can be brought tomorrow if they were willing to support it, but recalled how the Congress brought a bill to overturn the court verdict in the Shah Bano case. 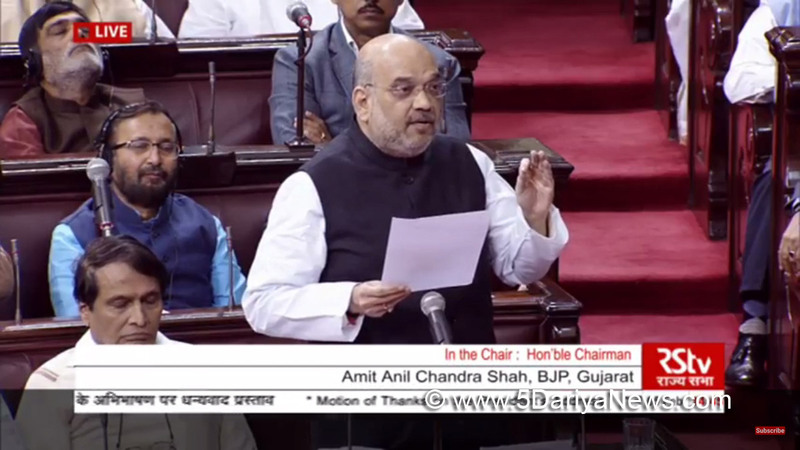 On the issue of simultaneous polls, which found a mention in the President's address, Shah said that "it will save money and prevent the need of frequent elections".Calling for a debate on the issue, he said it might seem the BJP has an advantage today but it can be the advantage of some other party tomorrow. Shah blamed the Congress for unemployment, an issue frequently raised by the main opposition party. "In 70 years of Independence, it was the Congress which ruled the country for 55 of those 70 years," he said, adding that the NDA government had found a solution and launched programmes such as Skill India, Start-up India, Stand-up India and Mudra loans.Terming the GST as the biggest reform ever undertaken, Shah said contrary to the Congress' allegations, the BJP had never opposed the reform during the UPA government's tenure but its "opposition was to the manner in which it was being proposed to be implemented".He said the UPA could not implement the GST because it did not have the trust of the states which were worried what would happen if there was a revenue shortfall. On Congress leader P. Chidambaram slamming Modi's remarks about selling 'pakodas' being a form of employment, he, alluding to Modi's humble origins, said: "Today if a person is earning livelihood by selling pakodas, tomorrow his son would become a big industrialist. A tea vendor's son can became the Prime Minister of this country" amid the opposition's hooting.Noting that "Antoyadya" was the government's mantra, Shah listed the government's steps to increase incomes and provide social security to farmers. At one point, he retorted to interruptions by Congress members, saying they will have to listen to him for the next six years.